Because the pleasures of taste – of good food! – are magnified while admiring a beautiful view, we have tried to create “dining areas” that are pleasant and relaxing, each furnished differently, so that lunch may become an occasion for frolic and entertainment. But actually, it’s much more than that. 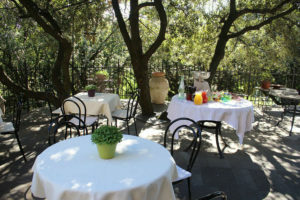 In good weather it is possible to dine on an enchanting terrace surrounded by oaks, where time seems to be marked only by the rustling of leaves and the chirping of cicadas. This is La Gabelletta’s largest room. Surrounded by glass doors that give on to the centennial forest of oaks, this room seems immersed in the woods surrounding it, suggesting a continuum between the inside and the outside. The central skylight, marked by four elliptical columns, ensures natural illumination during the day, while at night, the great chandelier, blown in Murano glass by the ancient glassworkers of Seguso expressly for La Gabelletta, creates a suggestive play of lights. The floor, in stone, takes the traditional Roman paving, recreating the charm of the compositional ways of the Opus Romanum. 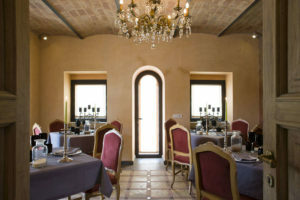 Cozy and intimate, the privée, with its vaulted ceiling and its stone, marble and terracotta mosaic floor, and its small courtyard paved with medieval cubes of white stone, summons feelings of harmony and tranquility. For an evening of romance, a business lunch or any special event, the privée is the room where affinities expand and hours pass like minutes! 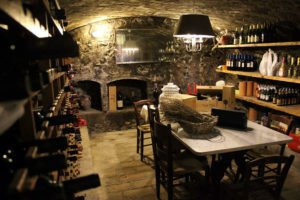 The inn and the wine cellar are the places of reminiscence: they remind us of old post stations or taverns, with the table rigorously made of Carrara marble, ceilings in wood and beautiful shelves with cabinets… An old world brought back to life with a modern twist, without losing reminiscences of the 17th century. The structure of the cellar, for example, was left unchanged. 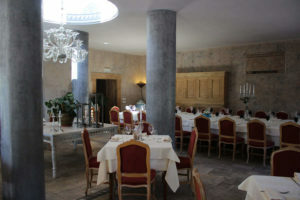 It is possible to dine on the table of the small inn or in the wine cellar itself, during the warm seasons. 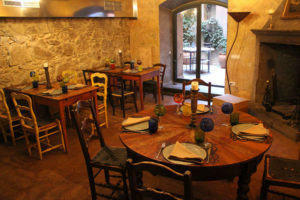 A vaulted ceiling, wooden tables, an ancient stone fireplace, a small private courtyard, colored glasses and iron lamps… In the bistro it is possible to smoke, eat, and sip a glass of fine wine – a simple but enchanting place. Because, as Oscar Wild said, “I have simple taste, I always settle for the best”. The small pleasures of life… among the trees, enjoying the evening while a cool breeze softens the heat of the summer, or maybe just sipping a cool beer in pleasant company while listening to music – this is what the terrace of oaks offers. Built as a “belvedere” over the woods, it is literally surrounded by trees that actually surpass the paving stone, showing the role that nature still plays in our beautiful Umbria.